May 9, 2017 – Madison. The Cities of Madison and Middleton have selected the winning offer from contractors who competed to serve the MadiSUN Solar Group Buy program, which helps residents easily and affordably invest in solar electric systems on their homes. The cities have selected a collaborative bid from Full Spectrum Solar and Midwest Solar Power, two solar installation companies based in Madison. 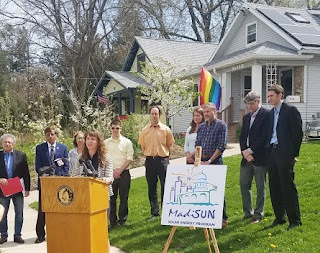 The MadiSUN Solar Group Buy program allows Madison and Middleton residents to “go solar” together. MadiSUN used a competitive Request for Proposals process to seek offers from solar companies across the region, and dozens of companies were invited to bid. For the first time, the program selected a collaborative bid from two companies, who will offer the same price and services. Alarik Rosenlund, Co-Owner of Midwest Solar Power, says his company is happy to partner with the program to bring more solar energy to local residents. "This year may be a real sweet spot for anyone looking at installing solar, especially with the tax credits and rebates available," Rosenlund said. But it's not just about the economics. "This is a great way for people to take action on something really important." 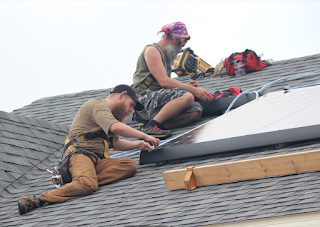 The cost of installing solar has never been lower, and households can receive a Federal Tax Credit for 30 percent of the system cost, while Wisconsin’s Focus on Energy program offers up to $2,000 in additional rebates. New solar education events were also announced, aimed at helping residents learn more about solar energy and the options available for installing solar. All events are free and open to the public. The dates, times, and locations information sessions are available at www.madisunsolar.com/upcoming-events and enclosed below. Madison earned a “gold” designation from SolSmart, the highest level of recognition from a national program under the U.S. Department of Energy’s SunShot Initiative. The “gold” designation recognizes the city’s efforts to accelerate solar development, from improving permitting and zoning for solar, to investing in financing and solar workforce training programs. The announcement took place at on Monday at the National Planning Conference in New York City. As a SolSmart Gold designee, Madison received national recognition for adopting programs and practices that make it faster, easier, and cheaper to go solar. 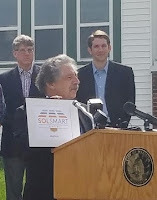 A SolSmart designation is a signal that the community is “open for solar business,” helping to attract solar industry investment and generate economic development and local jobs. Madison recently became the first community in Wisconsin to commit to a goal of 100 percent renewable energy. SolSmart is a national designation and technical assistance program that recognizes leading solar communities and empowers additional communities to expand their local solar markets. Funded by the U.S. Department of Energy SunShot Initiative, SolSmart strives to cut red tape, drive greater solar deployment, and make it possible for even more American homes and businesses to access solar energy to meet their electricity needs. Learn more at SolSmart.org. MadiSUN works to expand solar energy adoption through a comprehensive, community-wide approach. This group purchase program is operated by RENEW Wisconsin Inc., a nonprofit organization, on behalf of the City of Madison, with support from the City of Middleton. The goal of the program is to increase solar education and adoption in the Madison and Middleton areas through a group purchase and competitive bidding process. In conjunction with this program, RENEW Wisconsin and the City of Madison will partner with Summit Credit Union to provide a special solar loan program for Madison residents. This summer, participants can learn more and sign up at madisunsolar.com. All events are free and open to the public. Participants should RSVP to MadiSUN@renewwisconsin.org. Wednesday June 28th at 6:30 p.m.
Sunday July 30th at 12:30 p.m.